کاظمی, ملیحه‌سادات. (773). مقایسة نسبت Vp/Vsاز رابطة کاستاگنا و نگاره DSI. مجله ژئوفیزیک ایران, 6(4), 112-123. ملیحه‌سادات کاظمی. "مقایسة نسبت Vp/Vsاز رابطة کاستاگنا و نگاره DSI". مجله ژئوفیزیک ایران, 6, 4, 773, 112-123. کاظمی, ملیحه‌سادات. (773). 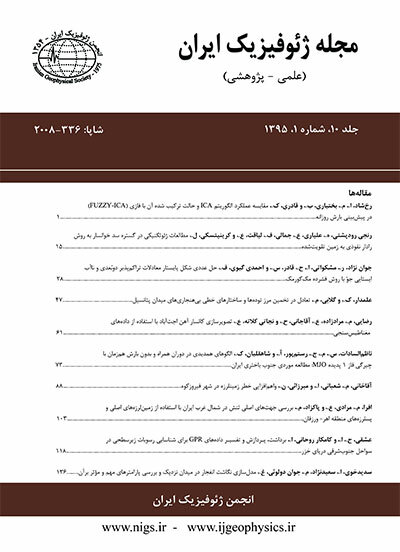 'مقایسة نسبت Vp/Vsاز رابطة کاستاگنا و نگاره DSI', مجله ژئوفیزیک ایران, 6(4), pp. 112-123. کاظمی, ملیحه‌سادات. مقایسة نسبت Vp/Vsاز رابطة کاستاگنا و نگاره DSI. مجله ژئوفیزیک ایران, 773; 6(4): 112-123. نسبت سرعت‌های امواج تراکمی به بُرشی در تعیین خواص پتروفیزیکی سنگ‌ها اهمیت زیادی دارد. نسبت Vp/Vs درحکم شاخصی برای تشخیص هیدروکربورها در نظر گرفته می‌شود. محاسبة سرعت موج بُرشی از نگاره صوتی بُرشی دو‌قطبی (DSI) در مقایسه با روابط تجربی دارای عدم قطعیت کمتری است. در این مقاله با استفاده از نگاره صوتی بُرشی دو‌قطبی روابط همبستگی بین Vp و Vs در سازندهای کنگان و دالان در مجاورت یک چاه در میدان پارس جنوبی مورد بررسی قرار‌می‌گیرد و با رابطة تجربی بین Vp و Vs کاستاگنا مقایسه می‌شود. با استفاده از روابط همبستگی محاسبه شده از نگاره صوتی بُرشی دو‌قطبی، Vs برای دو چاه دیگر در میدان مورد بررسی که فاقد نگاره‌های صوتی بُرشی دو‌قطبی بودند، به‌دست‌می‌آید. در این دو چاه با استفاده از داده‌های VSPفاکتور کیفیت (Q) تعیین می‌شود. ازآنجاکه فاکتور کیفیت فاکتوری با ارزش در تحقیقات مخازن محسوب می‌شود، در این تحقیق نسبت Vp/Vs به‌دست‌آمده از نگاره صوتی بُرشی دو‌قطبی و همچنین رابطة تجربی کاستاگنا با نسبت QP/QS مقایسه و روشن می‌شود که نسبت‌ Vp/Vs از نگاره صوتی بُرشی دوقطبی در مقایسه با نسبت‌ Vp/Vs از رابطة کاستاگنا تطابق بهتری را در ناحیة مخزنی نشان می‌دهد. Seismic velocities in rocks are used as indicators of their petrophysical properties. Vp/Vs has been used for many purposes, such as a lithology indicator, degree of consolidation, identifying pore fluid, and predicting velocities. The velocity ratio (Vp/Vs) usually depends on porosity, degree of consolidation, pore geometry and other factors. Vp/Vs is used as a lithology indicator for hydrocarbon detection. This ratio decreases with gas saturation. The Vp/Vs crossplot is used to identify fluid type based on the fact that shear wave velocity is more sensitive than the P-wave velocity due to the fluid effect. Two multicomponent measurements are important for gas exploration. These include Vp/Vs ratio and anisotropy behavior )Rojas, 2005). The results from laboratory and dipole sonic log data analysis showed that lithology has a significant influence on Vp/Vs ratio. Castagna, et. al. (1985) presented some empirical relation between P- and S-wave velocities. Wang (2000) developed an empirical equation that predicts S-wave velocity using the bulk density of the saturated rocks, the pore fluid modulus and the P-wave velocity. Brocher (2005) reviewed the existing Vs as a function of Vp, and proposed several new empirical relations based on a wide-variety of common rock types. When there is no shear wave log for a well, we must estimate Vs from Vp with correlation relations. Shear wave velocity associated with compressional wave velocity can provide accurate results for geophysical study of a reservoir. These studies have important role in reservoir characterization such as lithology determination, identifying pore fluid type, and geophysical interpretation. Vp/Vs is sensitive to gas in most clastic rocks and will often show a decrease due to its presence. Besides, shear wave velocities are much more sensitive to fractures than the P-wave velocity. Dipole sonic tools such as DSI are designed to excite both compressional and flexural energy in the borehole and are thus able to directly measure both compressional and shear wave speeds in all type of formations. A dipole source excites the borehole flexural mode that provide a means to determine shear wave velocities. Wave velocities and attenuation are two important properties that provide information about the saturation of the reservoir rocks. In general, by going deeper, the formation becomes harder and more rigid, with both Vp and Vs increasing and Q factor becoming higher. Generally, a high attenuation corresponds to a low velocity and a high Vp/Vs. The attenuation effects are directly related to the quality factors QP and QS as well as the QP/QS ratio. QP is noticeably affected by the presence of hydrocarbons. The ratio of the quality factors (QP/QS) is large in wet rocks and small in the gas zones. In this study, the log data for two wells from the South Pars gas field and the analysis of DSI in one of the wells are used to develop relationships between Vp and Vs. However, in order to apply the relations obtained between elastic properties of the rocks and petrophysical properties, it turns out to be necessary to calculate the elastic properties from seismic data, such as Vp/Vs. When there is no shear wave log for a well, we have to estimate Vs from Vp with correlation relations. In a well (well I) relationships between Vp and Vs near the walls of a borehole for Kangan (K1 and K2) and Dalan (K3 and K4) Formations of South Pars field are determined. The P- versus S-wave velocity crossplot for all layers, show very good correlations. Correlation relations between Vp and Vs could be used for two other wells (II and III) in which Vs was obtained with Castagna’s relation. The Q factors are obtained in the wells II and III as well. S-wave velocity estimation based on Vp could be used for regions wherein we have no core sample and DSI data. Also, the relations between Vp and Vs for other parts of this field are obtained by estimation of S-wave velocity. Finally, the relation between P- and S- wave velocities are obtained from DSI in comparison with Castagna’s relation. A good relation between Vp/Vs and QP/QS is then found based on the Vs used from DSI. کاظمی، م. س.، جواهریان، ع.، و قاسم‌العسکری، م. ک.، 1387، برآورد فاکتور کیفیت با استفاده از داده‌های نیم‌رخ لرزه‌ای قائم در یکی از میادین هیدروکربوری جنوب ایران، مجله ژئوفیزیک ایران، جلد 2 (2)، 79-90. Arroyo Franco, J. L., Mercado Ortiz, M. A., De, G. S., Renlie, L., and Williams, S., 2006, Sonic investigations in and around the borehole: Oilfield Review, 14-33. Brocher, T. M., 2005, Compressional and shear wave velocity versus depth in the San Francisco Bay Area: California, USGS. Castagna, J. P., Batzle, M. L., and Eastwood, R. L., 1985, Relationships between compressional-wave and shear-wave velocities in clastic silicate rocks: Geophysics, 50, 571-581. Castagna, J. P., Batzle, M. L., and Kan, T. K., 1993, Rock physics- the link between rock properties and AVO response in Castagna, J. P., and Backus, M. M., Eds., Offset-dependent reflectivity-Theory and practice of AVO analysis: Society of Exploration Geophysicists, 135–171. Dvorkin, J., Mavko, G., Walls, J., Taner, M. T., and Derzhi, N., 2003, Attenuation at Patchy Saturation – A Model, 65th Mtg. : Eur. Assn. Geosci. Eng., E23. Goldberg, D., 2003, Reprocessing of wireline sonic logs in turbidites and hemipelagic sediments at ODP Site: 1173, 1–15. Han, D. H., Nur, A., and Morgan, D., 1986, Effects of porosity and clay content on wave velocities in sandstones: Geophysics, 51, 2093-2107. Kumar, G., Batzle, M., and Hofmann, R., 2003, Effect of fluids on attenuation of elastic waves: 73th SEG meeting, 1592-1595. Mavko, G., Dvorkin, J., and Walls, J. D., 2005, A rock Physics and attenuation analysis of a well from the Gulf of Mexico: 75th SEG meeting, 1585-1588. Parra, J. O., and Hackert, C. L., 2006, Modeling and interpretation of Q logs in carbonate rock using a double-porosity model and well logs: J. Appl. Geophys., 58, 253-262. Pride, S. R., Harris, J. M., Johnson, D. L., Mateeva, A., Nihei, K. T., Nowack, R. L., Rector, J. W., Spetzler, H., Wu, R. S., Yamomoto, T., Berryman, J. G., and Fehler, M., 2003, Permeability dependence of seismic amplitudes: The Leading Edge, 22(6), 518-525. Walls, J., Taner, M. T., Mavko, G., and Dvorkin, J., 2002, Seismic attenuation for reservoir characterization: Quarterly report, DE-FC26-01BC15356. Xu, X., Hofmann, R., Batzle, M., and Tshering, T., 2006, Influence of pore pressure on velocity in low-porosity sandstone: Implications for time-lapse feasibility and pore pressure study: Geophysical Prospecting, 54(5), 565-573. Zhang, Z., and Stewart, R., 2008, Well log analysis and seismic attenuation in a heavy oilfield: Ross Lake, Saskatchewan, CSPG. CSEG, CWLS. Convention, 383-387.